There is a sound in the Kingdom built around sharing your “why” – the real reasons for the motivations of our hearts. If we try to convince others to adopt our why, it feels disingenuous and raises the resistance we all have for a sales pitch. If you simply share the why already in your heart, some will resonate, collaborate and join you. The key is to make a clear distinction between your why, how and what as we discussed in Finding Your Why. Here an attempt at my own heart-felt “whys.” Because there is something of God’s heart in our own hearts, these personal why’s have a prophetic attraction. Your why’s do as well. Get them in writing. Use this example as a starting place. Simon Sinek has a TED talk on You Tube that gives a great introduction to the importance of knowing your why. We use a Heart Plan Personal Develment Program per to help you find it. Why – We are all happiest, most productive, and prosperous when we cooperate with the destiny God wrote in our hearts. We naturally do what is already scripted in our hearts. Minds obey, hearts volunteer. Obedience doesn’t define spiritual maturity; initiative does. Please the Father – I want to please my Father. I love to hear Him say “well done” and I love doing what He does. The resulting experience of flowing with His Spirit, the fruit, the power, the prophetic confirmations, and the divine appointments are amazing. Release my own heart – I want this cooperation with the Father to flow from the desires He wrote in my heart very naturally. Obedience doesn’t describe my half of this equation. I’m volunteering from my own heart to be chosen for His initiatives. I’m even volunteering my own initiatives and discerning them in His presence… I’m sensing that my Father is pleased with my creativity and boldness. Reformation – I want to play a role in changing the world. I want to be part of the biggest thing God is doing: building His Kingdom, blessing nations, and improving cultures. Release hearts – I want to be a living example of practical spirituality in business. I want to help people connect with their own hearts and set captives free to find their mountain and share their portion of putting the Kingdom first. I want to help them become themselves. Wealth creation – I want to build a bridge between business and ministry; between vocation and calling. I want to be an entrepreneurial example of creating value for other people in a way that creates the wealth that makes ministry sustainable. I want to Have Fun, Make Money and Love People from my heart. How – In contrast, here’s the next level of “How” we make it happen. Heart Plan – We’ve created a coaching tool called the Heart Plan that helps people connect the dots between the why’s in their life purpose and the how’s of making it happen in the real world. It includes goals, cash flow, a business / life plan, team members. Most importantly we identify the heart boundaries holding them back and find the reason to trade those for the reasons God placed in their hearts to do something great. We use a prophetic gifting to compliment the wisdom of discerning true heart’s desires and the boundaries that keep us from our dream. Corporate heart plans – We use Corporate Heart Plans to help CEO’s get in touch with their own hearts and Kingdom purpose, and then take the same concept into the company. It lays a foundation in corporations via management teams who all understand and share their why. These people and companies aren’t just producing widgets for dollars. Just like the rest of us, they have a Kingdom calling which God is allowing them to choose… and many of them are saying, “Yes, Lord.” The jailbreak has started! When the Kingdom why is understood it has prophetic motivation for other hearts that can be leveraged in employee morale and customer marketing. Affiliate Coaches – It takes time and some level of relational trust to get through the heart plan and track the progress. God has other people in the wings who already want to share this approach to Releasing Kings. We’ve already found some great ones… HeartPlan.eu and Educationviaheart.com. Live conferences and workshops – The Spirit behind touching the desires of your heart has to be experienced to taste and see how good the Lord really is. Your dream really can come true. In fact, that’s how God is building His Kingdom. Watching the lights come on for a group of people in the presence of God is one of my greatest pleasures. Books and blogs – The message of Releasing Kings is powerful and compelling because it’s an invitation into your own dream coming true. It’s exceedingly and abundantly beyond all you could ask or imagine. Capturing this paradigm shift in words is a prophetic adventure that we enjoy. What we do and create – our product is to release hearts into their Kingdom Mountain to bear fruit. 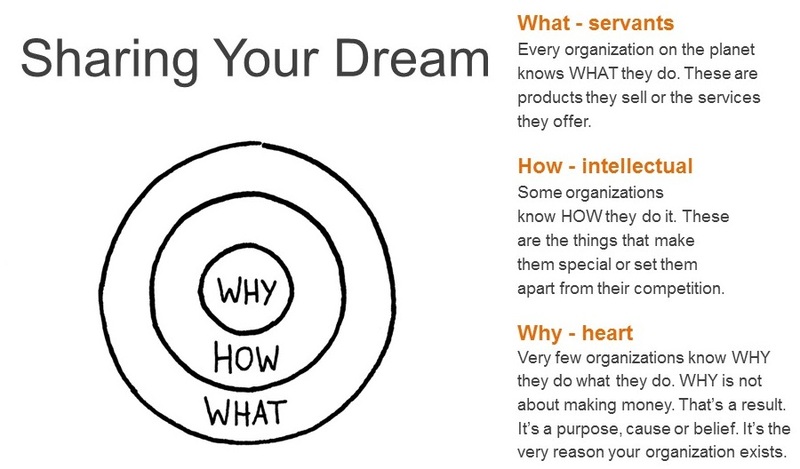 Implement your why in your business or vocation and see your dream come true. Kings – God is raising up an army of volunteers in the Kingdom who share God’s heart are industrious, bold, creative, artistic and articulate. They not only find their mountains, they move those mountains toward the Kingdom. They take dominion over circumstances and shape them, yet they set captives free and lead people into the liberty of experiencing their own heart’s desires. They help others make their dreams come true… that’s how the Kingdom is built. Business as ministry – The people who own, lead, and operate a company are really expressing their God-given gifts and ministries in the course of operating that company in the Business Mountain. We are just beginning to realize that churches and missionaries are not the only (or even primary) means of building the Kingdom. God does ministry through … education, government, the media, entertainment, business, etc. Multiplication – These Kings operate in every traditional spiritual gift plus one. They minister in healing, the prophetic. They pastor and teach with anointing. They carry apostolic authority and have evangelistic favor. They also carry the wisdom to create wealth and operate in abundance. They are both spiritual and natural – the wall has come down. Blessed nations – The more this army is released, the more nations are blessed in every mountain. They are making disciples of “all nations.” The freedom and love they’ve experienced in their own hearts is highly contagious… it’s more releasing than religious, more compelling than confining, more cooperative than competitive. Assignment – Write down your why and share it. Need help? We use a Peart Plan on a personal level and a Corporate Heart Plan on an organization level to help people get connected with their why. The introductory phone call is free.